With OverDrive on a Kobo Forma, Aura ONE, Aura H2O Edition 2, Aura Edition 2, or Clara HD, you can borrow free ebooks from your public library right from your device. Follow the steps below to sign into OverDrive and get started. Note: If you're using an older Kobo ereader, like an earlier Kobo Aura, Touch 2.0, or Glo, you'll need to transfer library ebooks from a computer using Adobe Digital Editions. From the Home screen, tap the menu in the upper-left corner. Go to Settings > OverDrive. Select Sign in to OverDrive. Find your library on the Find a public library page. Tap your library's name to sign in. Sign in with your library card, an OverDrive account, or Facebook. Select Browse to start exploring Kobo's catalog, or select Search to find a specific title. Tap an ebook to open its details page, then tap to borrow it or place it on hold (if owned by your library). Borrowed ebooks will appear in the Books section of your Kobo, just like purchased ebooks. Library ebooks are automatically returned to your library at the end of the lending period, so you never have to worry about late fees. Filter the Kobo catalog so you only see ebooks your library owns. Browse your library's featured collections. Read OverDrive ebooks you've borrowed elsewhere (if they're available in the Kobo catalog). Renew library ebooks using the Request again option (in the book actions menu). This will let you borrow the ebook again immediately after its lending period expires (if there are no existing holds), or place you on the title's wait list (if there are existing holds). Return library ebooks early (before the end of the lending period). 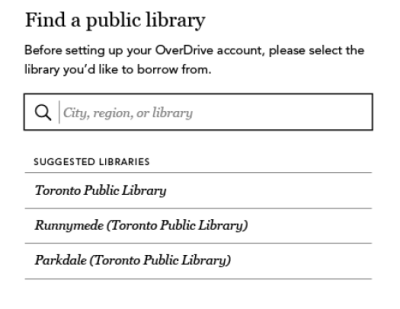 For more information, or if you need additional assistance with OverDrive on your Kobo, please visit Kobo's help site.